During the Sunday Angelus prayer in St. Peter’s Square, Pope Francis unveils his very own user profile in Click To Pray, the official app of the Pope’s Worldwide Prayer Network, including its youth branch, the Eucharistic Youth Movement – EYM. Click To Pray (www.clicktopray.org) is a platform that invites men and women from around the world, to accompany the Pope in a mission of compassion for the world. It has a website and a mobile app, both for Android and iOS, with its social networks, available in six languages (Spanish, English, Italian, French, Portuguese, and German). Click To Pray has three main sections: “Pray with the Pope”, with the Pope’s monthly prayer intentions for the challenges facing humanity and the mission of the Church; “Pray every day”, with a prayer rhythm involving three daily moments; and “Pray with the network” that is a space where users (Pope Francis among them) can share their prayers with the others. Pope’s Francis own profile (https://www.clicktopray.org/en/user/popefrancis) can be found clicking in the Pope Francis button at the “Pray with the Network” section. Click To Pray is the official prayer platform for World Youth Day 2019, which takes place in Panama from 22-27th January 2019. For this event, the platform includes a special multimedia section to pray and meditate the Rosary for Peace. 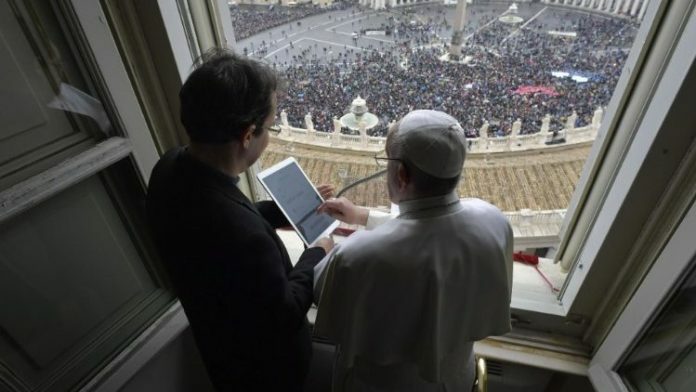 The app, called Click to Pray, is available on both Android and iOS devices and will allow over 1 billion Catholics worldwide to pray with the pope online. Pope Francis has his own Click to Pray profile online, which shows what he is praying for. Users can then click an icon to pray with him.